The Blues came from behind to seal the success. 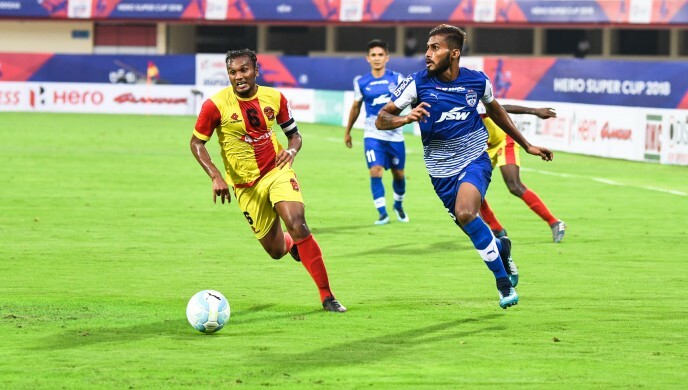 An injury time winner (90+5’) from Udanta Singh sent Bengaluru FC to the quarterfinal of the Super Cup after Miku’s equaliser (70’) saw the Blues claw back from a goal down to beat Gokulam Kerala FC 2-1 at the Kalinga Stadium, on Sunday. The Bengaluru winger, who used his blistering pace down the right to set up Miku to make it 1-1, tapped home a pass from the Venezuelan to give Albert Roca a winning start to the tournament. Earlier, Roca rolled out a full-strength squad that included John Johnson, Juanan Gonzalez, Rahul Bheke and Subhasish Bose in defence. Meanwhile Miku and Udanta had Sunil Chhetri for company in attack. Bengaluru started the game hitting all the right notes and Chhetri was denied twice in a space of two minutes. The Blues’ skipper saw his shot on goal saved by ’keeper Nikhil Bernard. He then had another chance from the resulting corner put away after Mohammad Rashid cleared on the line. Bose and Udanta kept the Gokulam defence busy with darting runs and crosses in dangerous areas inside the box. But it was the team from Kerala that shot into the lead after Salman K’s pass over the Bengaluru defence found Henry Kisekka who calmly scored past Gurpreet Singh Sandhu to make it 1-0 in the 33rd minute. Gokulam did well to see out the half without conceding, but found Bengaluru’s pressure in the second half, tough to deal with. 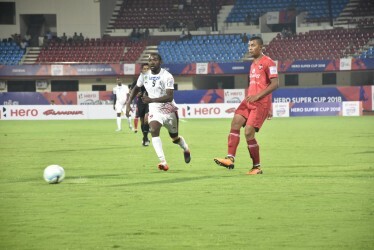 The woodwork denied Bengaluru an equaliser in the 49th minute when Bose’s attempt after being set up by a smart flick form Miku, crashed into the post. Chhetri soon came close, rising to nod a cross from Udanta, but the effort was off target. Bengaluru’s intent bore dividends when Miku calmly stroked the ball low into the corner after a fantastic cut-back form Udanta. The striker then seemed to have closed the game when an audacious attempt that saw him lift the ball over an out of place Bernard, looked like bouncing in. But a desperate effort from Emmanuel Chigozie saw the defender get just enough of a leg on the ball to put it out for a corner. Gokulam’s resolve was finally broken when Miku paid back the debt of a pass to Udanta with just a minute left on the clock, and the winger slotted home to complete the comeback. In the quarterfinal, the Blues will face the winners from the clash between Kerala Blasters and NEROCA FC. Bengaluru now head to Guwahati to take on Aizawl FC in an AFC Cup clash on Thursday.